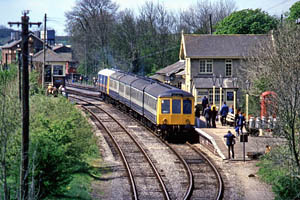 Black Eight Railtours advertised the "Mendip Meanderer" to run on the 4th May 1987 with an attractive itinerary - Birmingham New Street, via Kidderminster and Swindon, to Cranmore for a ride on the East Somerset Railway, then to Bristol, where participants could visit Bath Road Depot, or find their own way to the Bristol Industrial Museum and the S.S. Great Britain, and the steam shuttle service between the two. Thus it was that I found myself, along with four fellow members of the SRS, waiting for the train at Kidderminster (BR). Our train was to be a 4-car Tyseley set, which duly arrived about 8 minutes late, assisted in the rear by, of all things, a motor parcels van! Apparently Western Region had insisted on the higher power - to - weight ratio this would give, bearing in mind the nature of our route. We travelled via Worcester to the last pick-up point at Cheltenham, then ran straight through Gloucester to Standish Jcn, where we were to take the Sapperton line. We were 3 minutes early by this point, and had to stand a few minutes to allow a preceding service train - presumably the 0927 from Cheltenham to Swindon - to clear the section. The necessity for the parcels van became apparent as we climbed steadily to Sapperton tunnel, thence running quickly down to Swindon, 2 minutes early, at 1044. A great number of withdrawn 25's and 40's stood in the works yard, accompanied by a solitary preserved "Western", apparently D1015 "Western Champion". Reversal at Swindon took us via Chippenham to Thingley Jcn, where we joined the line via Melksham, with its recently restored passenger service, to Westbury. Again much activity amongst the number crunchers as we passed the large number of locos on Westbury Depot, where the unique 47 901 was resident. Counted among the number crunchers could be a gentleman with whom we sat for the entire journey, who had joined the train at New Street. This person was the proud possessor of a griceable gaberdine raincoat, forces surplus, complete with works number and construction date! Sadly, none of the SRS contingent was quick enough to record the details, so the appropriate line in the Ian Allan book of raincoats will have to remain unmarked. We ran quickly down the West of England main line, via the Frome avoiding line, to East Somerset Jcn, where we joined the branch to Cranmore, the former through route, via Cheddar, to Yatton on the Bristol - Exeter line. Our progress now was much slower - we had been allowed 21 minutes to traverse the 5.5 miles to Cranmore. This seemed unduly pessimistic, but in fact, having joined the branch precisely on time, we arrived at our destination 2 minutes late, after stopping at every signal to make a phone call. The story which later passed down the train was that, owing to a broken rail or connection, the track circuiting was out of action, and the driver was having to phone Westbury power box, from where the branch is signalled, to inform them of the precise location of our train! Main point of interest along the branch is of course the Foster - Yeoman sidings and shed, home of the American - built class 59 locos. Being a bank holiday, all four of these unusual (ugly?) locos were present, along with the earlier "Western Yeoman II" built in 1980, ex-BR 08 no.33 "Mendip" and a Yorkshire Engine Co 0-6-0, ex-BP Oil at Purfleet. With a clear hour before departure of our special train on the ESR, we walked the short distance to the local hostelry, where we celebrated the birthday of the unfortunate Andy (he had to buy the drinks). Suitably refreshed, we joined our train for the short journey to Mendip Vale, in the middle of nowhere (but reputed to be somewhere near Shepton Mallet). 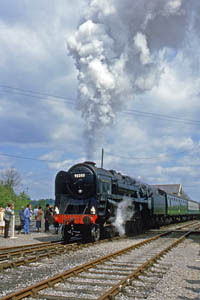 Motive power for the outward journey had been "Green Knight" no. 75029, running tender first. Now 92203 "Black Prince" nosed onto the train for the return run. I cannot say "backed on" for this locomotive was also to run tender first! A pity they couldn't have been swapped around, but presumably this would have upset the schedules. The practice seems to be to have a loco at each end of the line, one for the outward journey and one for the return. On arrival back at Cranmore, we had to wait for the next service train to depart before our DMU, which had been lurking a few hundred yards down the line towards Westbury, could run back into the station. Departing 5 minutes late, at 1405, we returned along our earlier route, via Westbury, to Bradford Jcn, where we swung to the left to take the Bath and Bristol line, and after a pleasant run along the very scenic stretch to Bath, arrived in Bristol at 1517, on time once again. At this point, the party split up, a large number heading for Bath Road depot. Having no great desire to visit the depot, I walked with the aforementioned Andy to the Industrial Museum, alongside the floating harbour, where Peckett 1940 of 1937 "Henbury" was in steam, operating a return trip with "Toad" brakevan and open wagon to the SS Great Britain, every fifteen minutes. We were able to photograph these runs from both sides of the harbour, walking to the other (north) side past Canons Marsh Goods Depot, long disused but still intact, tucked away behind the Cathedral and Library. We returned to the station to rejoin the others for our departure at 1752. The visit to the depot had been a successful one, with 40 locos on shed, of classes 08, 31, 37, 45, 47, 50 and 56. Our return journey retained great interest, for instead of returning directly up the main line, we turned left at Narroways Hill Jcn to follow the single track to Avonmouth, the line which carries the Severn Beach passenger service. The line climbs steadily to Clifton Down, where there is a passing loop, before diving into the tunnel under the Downs, to regain daylight overlooking the Avon Gorge. Rail traffic is no longer handled at the docks, apart from one or two private industrial sites, and the scene where the dock lines used to run, operated in recent years by a fleet of Shrewsbury - built Sentinel and Rolls-Royce diesel hydraulics, was one of desolation. The line carrying the passenger service comes to to dead-end at Severn Beach, so at Hallen Marsh Jcn we took a right turn onto the freight-only line to Filton Jcn, passing the now disused North Filton Platform at the British Aerospace works, where the prototype "Concorde" stood silently in the distance. Filton Jcn brings us back onto the usual route from Bristol, and a pleasant if uneventful run back to Standish Jcn, where we regained our outward route, After stopping to set down at our earlier pick-up points, and still running more - or - less to time, we arrived back in Kidderminster at 2006, after an excellent and most interesting day out. Our thanks must of course go to Black Eight Railtours for their first rate organisation of the tour, and hope that they were able to raise adequate funds to help them continue to maintain and run 8233 on the Severn Valley.